What’s the proper way to punish your kids when they’re acting up? Different parents will offer different solutions, but we’ve seen plenty of examples of how faith-based punishment can go wrong. Most famously, the sort of physical abuse promoted by Christians Michael and Debi Pearl in To Train Up a Child has left many victims scarred for life. Richard A. Conn, Jr., an international lawyer with four children of his own, has a different approach to parenting because he’s non-religious. He doesn’t tell his kids they need to act a certain way because God is looking down on them, he doesn’t threaten them with hellfire, and he abhors any kind of physical punishment. 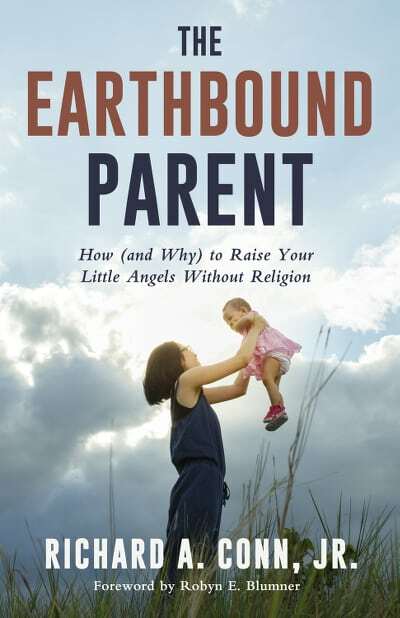 His new book describing this approach to parenting is called The Earthbound Parent: How (and Why) to Raise Your Little Angels Without Religion (Pitchstone Publishing). While the book covers all kinds of issues regarding parenting, the excerpt below focuses specifically on how to discipline your kids. Parents often ask me how to discipline children without the “threat” of a god punishing them, but discipline without religion is simple. The typical religious threat — burning in hell — is a bit like using a nuclear weapon to kill a fly. Putting aside that the threat itself introduces irrational thinking (religion) to your children, thereby confusing them and making discipline less clear, it is overkill. Who needs a threat of eternally burning in molten lava to get a child to go to bed on time? Frankly I view such tactics as psychologically abusive. There is no need to terrorize your own child. In a secular household such threats would be meaningless. So, absent that nuclear weapon, how do you discipline your children? With a little thought, you can provide structure and discipline for your kids without invoking the disapproval of a deity that controls the universe. A tiny fly swatter is more than sufficient. The first thing to remember is that disciplining youngsters begins with disciplining yourself. If you are able to control yourself, you will have no trouble disciplining your children effectively. If you rarely get angry (admittedly a tall order) and stay relatively detached when your child misbehaves, selecting the right punishment is simple and will generally depend upon your child’s age and the severity of the misbehavior. I know this is hard for some people. If you are upset, take a walk or a drive or a break. Do whatever you can to avoid having your bad mood affect your interaction with your child. Being consistently warm toward your children and steady in utilizing discipline on the rare occasions it is needed are key elements of effective parenting. Children not only need but also want your affection and support. So be absolutely clear up front about the type of behavior you expect from them. Set schedules for the children and keep to them. Offer praise frequently. In other words, discipline begins by setting out proper behavior so your kids know where the lines are. Decide upon your disciplinary steps before they are needed since you will be too emotionally involved to think clearly when you need to employ them. Do not strike your child EVER (though gently pulling kids apart from one another when they are physically fighting is fine). There are schools of thought that encourage gentle paddling in extreme cases on the theory that having an object to point to adds control and minimizes the use of corporal punishment. I suggest not doing this because many people have trouble drawing lines once they cross that rubicon of striking a child. Use time-outs as your primary tactical weapon! Putting a child in the corner or in a separate room is very effective in the early stages of life even if the time span is merely a few seconds. It is your disapproval symbolized by this action that affects the child. When the child is older, slightly longer time-outs are useful. Gentle deprivations of privileges work wonders as they get even older, particularly if you combine them with calm explanations of your family rules and why they are being punished so they will feel fairly treated. Children like all people crave fairness, so use dispute resolution techniques as part of discipline. Ask each child what happened and let each speak. Encourage honesty, sharing, mutual respect, and whatever other values matter to you. How you resolve problems is how they will do so. In time, they will follow your lead and resolve their own disagreements using the methods you showed them. When you must impose a punishment, stay calm and show regret that you must do this. There is no need to yell, hit, or threaten with eternal damnation! Never forget that you are the main role model, so how you behave will become how they behave. This includes their observations of how you behave in resolving conflicts or when you are upset with them. Finally, try asking a misbehaving youngster if he or she wants to play as an alternative to discipline when you see a problem developing (the kids begin to push or tease each other). This diffuses the situation and almost always results in a “Yes!” followed by a change in the child’s emotional state. Attentive parenting leads to fewer instances arising where discipline is required. The Earthbound Parent is now available online and in bookstores. 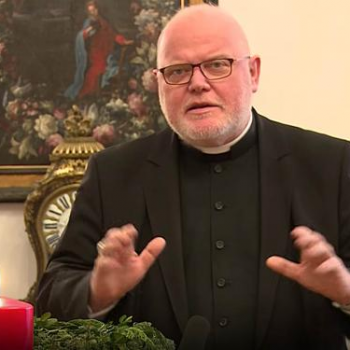 This Man Hates Bavaria's New "Display the Cross" Law. Surprise: He's a Cardinal. "In most races where christians (0r any religion) compete with common sense and stupid stupid ..."
"I'm certain you have the sense to make the drive home without partaking. The 99 ..."
"Edit: Their parents bought their way through college." "So forcing women to have kids to punish them. You really love kids, I can ..."